China’s recent leadership transition was widely depicted as a triumph for conservative hard-liners and a setback for the cause of reform – a characterization that has deepened the gloominess that pervades Western perceptions of China. In fact, nothing could be further from the truth. NEW HAVEN – China’s recent leadership transition was widely depicted as a triumph for conservative hard-liners and a setback for the cause of reform – a characterization that has deepened the gloominess that pervades Western perceptions of China. In fact, nothing could be further from the truth. Xi Jinping and Li Keqiang – the top two officials in China’s new governing council (the Standing Committee of the Politburo) – are both well educated, well traveled, and sophisticated thinkers who bring a wealth of experience to the many challenges that China faces. As so-called Fifth Generation leaders, they continue the steady progress in competence that has marked each of China’s leadership transitions since the emergence of Deng Xiaoping in the late 1970’s. While it is entirely premature to judge the style and direction that China’s new leaders will take, three early hints are worth noting. First, Xi’s assumption of power is more complete than was the case in earlier transitions. By immediately taking the reins of both the Chinese Communist Party (CCP) and the Central Military Commission, he has a greater opportunity to put his personal stamp on policy than his predecessors had at the start of their administrations. Yes, China governs by a consensus of the Standing Committee. But Xi is well positioned to drive the thinking of a now-leaner decision-making body (downsized from nine members to seven). Moreover, he has long favored a market-friendly, scientific approach to economic development, which will be vital to China’s future. Second, Li Keqiang – the presumptive incoming premier – could be the big surprise in the new leadership team. Unlike the current premier, Wen Jiabao, who was third in the chain of command for the past ten years, Li has been elevated to number two, which suggests a greater potential for power-sharing between the CCP and the government at the top of China’s new team. With a Ph.D. in economics, Li, who, as Executive Vice Premier, headed the all-important “Central Committee Finance and Economy Leading Small Group,” is especially well equipped to deal with the long-awaited structural transformation of China’s economy. Indeed, having overseen China 2030 – an extraordinary joint report recently produced by the World Bank and China’s own high-level think tank, the Development Research Center – he has a deep understanding of the roadmap that China must embrace. His promotion could be a major step up from Wen, who emphasized rhetoric and strategy more than implementation. Third, and contrary to prevailing wisdom in the West, Wang Qishan, one of China’s savviest and most experienced senior officials, has not been relegated to obscurity in his new position overseeing “discipline” on the Standing Committee. Yes, Wang has invaluable experience in the financial sector, and it would have been logical for him to assume similar responsibilities on the new leadership team. But, as one of the top seven in the CCP hierarchy, he will still be able to weigh in on all important economic and financial matters, while assuming responsibility for tackling one of China’s toughest problems – corruption. Having known Wang for more than 15 years, my sense is that he is very well suited to this vital task. The other members of the new Standing Committee bring a broad array of experience and skills. That is especially true of Yu Zhengsheng and the two Zhangs, Dejiang and Gaoli, who come from senior roles in three of China’s most powerful and dynamic urban centers – Shanghai, Chongqing, and Tianjin. Their deep knowledge of the key role played by urbanization in driving economic development will be critical to broadening the structural transformation that China now faces. The West is not only overlooking the new Chinese leaders’ enhanced skill set, but is also misjudging the current state of the country’s economy, which, while far from perfect, is not crisis-torn and in desperate need of a quick fix. In fact, China is emerging in reasonably good shape from yet another global slump. This gives its new leaders leeway between now and the National People’s Congress in March 2013 to focus on the development of implementation tactics for their strategic agenda. None of this is to minimize China’s enormous challenges. But strategy is not the problem; the pro-consumption 12th Five-Year Plan lays that out with great clarity. The new leadership must now shift the focus to commitment and implementation of that strategy – namely, through enactment of a new set of bold reforms, especially those related to the services sector, the social safety net, and state-owned enterprises. Xi’s emphasis on the “top-level design” of reforms lends itself particularly well to this agenda, as does Li’s intimate familiarity with the detailed blueprint provided by China 2030. Those were not exactly enlightened words – especially in view of what was shortly to come. 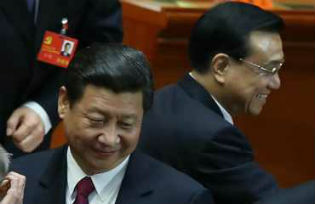 Yet Deng seized the moment at a critical juncture that is strikingly reminiscent of the one now faced by Xi and Li. As is the case in any country’s leadership transition, no one knows for certain whether China’s incoming administration is up to the multiplicity of challenges that they face. Since the days of Deng, China has had an uncanny ability to rise to the occasion and meet its challenges head on. The new generation of leaders has the right skills and experience for the task. Western biases notwithstanding, we will know soon enough if they can translate strategy into action. Stephen S. Roach was Chairman of Morgan Stanley Asia and the firm’s Chief Economist, and currently is a senior fellow at Yale University’s Jackson Institute of Global Affairs and a senior lecturer at Yale’s School of Management. His most recent book is The Next Asia.